In Navajo mythology, Black God (Haashchʼééshzhiní), is seen as the god of fire and creator of the constellations. Fathered by Fire and suckled by a Comet, Black God the personification of Fire, is also seen as the inventor of the fire drill. Though (unlike myths from other traditions) I’ve found no embellished stories of how he discovered the fire drill. He is not typically portrayed in the admirable, heroic fashion of other Gods. Instead, he is imagined as old, slow and apparently helpless, and other times he is imagined as a moody, humorless trickster who “passes himself off as poor so that people will be generous to him. Black God is commonly depicted as having a crescent moon on his forehead, a fullmoon for a mouth, the Pleiades on his temple and he wears a buckskin mask covered in sacred charcoal with white paint. As one version of the Navajo creation story goes “The Sky and the Earth were placed after the People emerged from a series of previous worlds. Four Holy People – First Man, First Woman, Salt Woman, and Black God – sat together and planned the conditions of life on earth. These four figures are collectively responsible, not just for the organization of all things terrestrial, but for the placement of the stars themselves. Of the four, however, because of his association with fire, the Navajo saw Black God as responsible for the creation, and sustaining of the celestial bodies.As the story goes, First Man, First Woman, Salt Woman were sitting in a hogan (a Navajo hut made of wood and dirt) when Black God entered with the constellation of Pleiades affixed to his ankle. When several of the Holy People commented on the presence of this constellation, Black God stamped his foot vigorously, bringing the constellation to his knee. A second stamp… brought the stars to his hip.The Holy People were impressed by Black God’s display and nodded approvingly. Black God then stamped his foot a third and fourth time, until the constellation was lodged in his temple. Satisfied, Black God declared: “There it shall stay!” The Holy People were so captivated by Black God’s performance that they gave him the responsibility of creating constellations with which to adorn the “upper dark.” Black God acquiesced, carefully arranging his star crystals throughout the heavens until the night sky was beautified by his glittering constellations. Yet, the crystals had no light of their own, and the night sky remained dark. To solve this problem, Black God placed some of his fire in the sky by providing an igniter star to radiate light for each constellation.Black God went on to impart his fire unto the sun. In a version of a wintertime 9 day healing ceremony called the Nightway, On the ninth and final day, a man arrives in the guise of the Black God. It is said that he carries a fire-drill and shredded bark, all from a cedar tree which has been hit by lightning, from which he will make many fires. 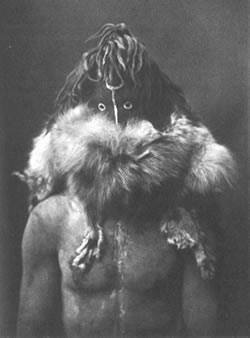 He is typically recognized by a buckskin mask that is blackened by sacred charcoal, save for several white markings: a full moon for a mouth, a crescent moon in the center of his forehead, and the Pleiades on his left temple.